The local history collection at the Burlington Public Library includes books, clippings, family genealogies, photographs, maps, diaries, postcards, newspapers, and other print materials, including many compilations assembled by town historian Leonard Alderman. This unique collection supports our mission to collect, preserve, and store information relating to the history of Burlington and its residents and to make it available to the public. Because of the nature of these materials, items in the Burlington Room do not circulate, and the collection is only available when staffed. Digitizing and cataloging of the collection is ongoing, but the collection is not available online. Regular hours for the Burlington Room are Tuesday & Thursday, 10am-2pm. Please call or email ahead to confirm, as hours are subject to change. To make a research appointment, please email Marie Spratlin Hasskarl at mshasskarl@burlingtonctlibrary.org or Jodi Papazian at jpapazian@burlingtonctlibrary.org or call 860-673-3331. Visit the Town of Burlington’s website for a history of the town. 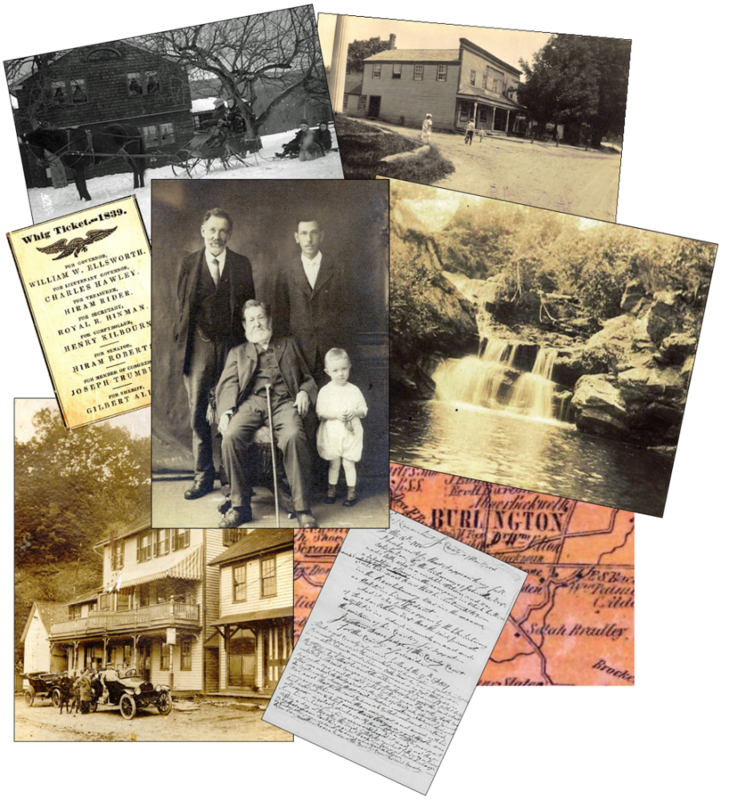 Visit the “Our History” section for brief historical sketches about the town, the Elton Tavern, and the Center Schoolhouse. Selected resources from ancestry.com, including the Hale Collection of Cemetery Inscriptions, WWI-era Military Census and Military Questionnaires, selected church and probate records, and more. HeritageQuest Online, which includes U.S. Census records and other valuable resources for family history research. A program of the University of Connecticut Libraries in collaboration with the Connecticut State Library, the CTDA preserves and makes accessible digital resources from museums, libraries, historical societies, and cultural organizations throughout Connecticut. Try a basic search for “Burlington” to see materials related to local history. Do you or members of your family have diaries, letters, identified photographs, ephemera (programs, ticket stubs, menus, flyers, etc. ), or other materials relating to the history of Burlington and its residents? Contact Marie Spratlin Hasskarl at mshasskarl@burlingtonctlibrary.org or 860-673-3331 to discuss a possible loan or donation. Loans allow us to copy materials for our research files, with the original materials being returned to you. Items that are offered and accepted for donation are stored in archival-quality folders or storage boxes, so that they will be preserved for future generations. non-print materials. If you have objects or artifacts that you would like to donate, contact the Burlington Historical Society at collections@burlington-history.org. Monetary donations are always welcome. All funding for archival supplies and the purchase of new books for the Burlington Room comes from the Burlington Library Association. You can make online donations through the Burlington Library Association.